Blazer Horses were developed in the 1950s and 1960s in northwestern United States. They can trace their ancestry to one chestnut stallion named Little Blaze, who was foaled in 1959. Little Blaze was bred and owned by F. Neil Hinck, an American horse trainer from Bedford, Wyoming. The descendant of Mormon pioneers and Danish horsemen, Hinck came from a ranch family and had extensive experience with most breeds of the day. Little Blaze was combinationof American Quarter Horse and Morgan Horse with some Shetland Pony and Thoroughbred. Blazers are known for being versatile at any sport competition and having gentle and intelligent dispositions. Blazer horses do not exceed 15 hands (60 inches, 152 cm) at full maturity, although they can be registered as small as 13 hands (52 inches, 132 cm). 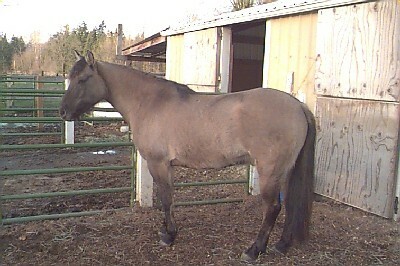 Their colors include black, bay and chestnut, as well as buckskin, palomino and many shades of dun. They have a refined head, bold eyes, extreme sloping of the shoulders, short backs, round croups, long hips, and have thick bone for strength and durability. They must also have a good disposition. The American Blazer Horse Association is one of the few Associations that mandate a gentle disposition as a registerable trait. The Blazer Horse Association was incorporated in 1967 at Star, Idaho. In 2006 it was renamed the American Blazer Horse Association and became a nonprofit, dedicated to the preserving the breed and maintaining its history. The headquarters was moved to Nampa, Idaho the same year. Registered Blazer horses in stud book must pass a veterinary inspection and have at least one parent with documented lineage to the stallion Little Blaze.